ActiveFeeds RSS Toolbar turns your internet browser into an information powerhouse! By integrating RSS capability into your web browser, ActiveFeeds delivers all the information you want right at your fingertip. 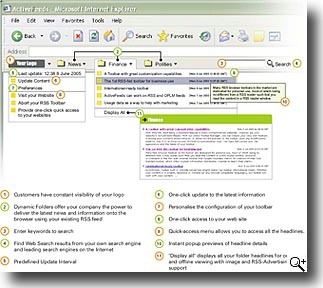 Browser toolbars are used by all major portal giants. The reasons are simple. A toolbar is easy to deploy, effective in delivering information, driving traffic and increasing business at your websites. However, up till now, toolbars remain a tool only enjoyed by the bigger business players. Realtime updates of toolbar profiles after deployment via the Web based Administration.